Indonesia is a transcontinental country encompassing over 17,000 islands across Southeast Asia and parts of Oceana, falling primarily across the equator, spanning from the far western island of Sumatra to the very eastern edge of Papua. The largest archipelago in the world, Indonesia is the 4th most populous country on earth with over 300 languages spoken across the islands. Given its location, the majority of Indonesian backdrops feature tropical rainforests, but all across the islands you’ll find exquisite beaches, clusters of volcanoes, idyllic rice fields and bustling city skylines. Everything from the landscape to the culture is hugely rich and varied, culminating in one of the most diverse nations you’re likely to visit. The most popular and well-known tourist destination is Bali; known for its forested mountains and spectacular religious sites, namely Uluwatu Temple, most come here for the buzzing resort towns and supreme yoga and meditation retreats. Jakarta, the capital, is a sprawling city with Dutch colonial buildings, a financial centre and excellent shopping opportunities. Defined by a historic mix of Javanese, Malay, Chinese, Arab, Indian and European cultures, Indonesia’s capital is a melting pot of ethnicities, serving up various cuisines and customs. Home to the planet’s 2nd highest level of biodiversity, after Brazil, Indonesia is a stomping ground for numerous fascinating species, particularly orangutans, komodo dragons and tigers, with over 60% of the country forested, allowing them to thrive. Offshore this great archipelago lies the greatest diversity of coral reef fish on earth, with over 1,650 species found in eastern Indonesia alone. Southeast Asia’s largest national park, Lorentz, in Papua, is just one of many wonderful parks throughout the country, ideal for spotting the local wildlife. Predominantly a Muslim nation, Indonesia’s testaments to Buddhism and Hinduism are some of the most mesmerising on the continent. Borobudur is the world’s largest Buddhist temple, protruding from dense palm forests and rice paddies, it was built in the 9th Century and consists of multiple stacked platforms topped by a magnificent central dome. The Hindu Prambanan, dated to the 8th Century, is a UNESCO World Heritage Site listed temple complex marked by a 47 metre-high central structure, also in Central Java. With so many islands, ferry travel is extremely widespread and is a popular mode of transport in Indonesia. The majority of routes are domestic, inter-island connections between some of the country’s most popular holiday destinations such as Bali and Lombok, but fast and frequent sailings from Singapore are also available. 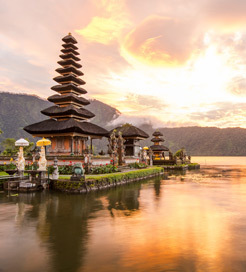 All Indonesian routes are operated by a wealth of excellent ferry companies, offering a huge choice of timetables to suit your budget and schedule. For more information, please visit our Ferries from Bali to Indonesia page. For more information, please visit our Ferries from Lombok to Indonesia page. For more information, please visit our Ferries from Gili Islands to Indonesia page.